It is not always I get up at 4.30 am in Kuwait. My normal get out of bed time is 5.30 am. And even when I get up early, to get some office work completed at home, undisturbed, I do not venture out to the Balcony to take a glimpse of the early morning sky. 14 September 2015 was different. I got up around 4.15 am. I had no office work to do. I just ventured out to the Balcony and looked up. 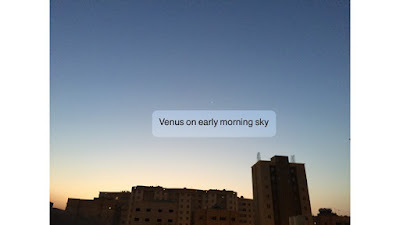 And I was lucky to get a super glimpse of Planet Venus on the early morning eastern sky in Kuwait.